Canada requires all entrants to have a passport or enhanced driver’s license. You will be expected to check in at one of the customs ports, or if you are flying directly into Canada, the airport customs is sufficient. You will need to follow the same rules of entry and exit in regard to declaring all items of interest. Be certain that your boat is up-to-date with U.S. Coast Guard requirements before going through, as you may be asked for an inspection if you are re-entering the United States. Directly to the north of the San Juan Islands, this Salish Sea island chain continues across the Canadian border. 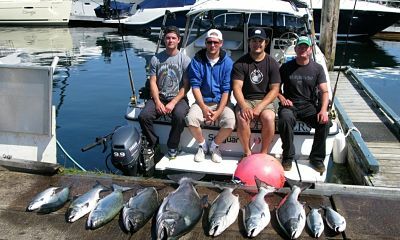 The Gulf Islands are on the protected eastern side of Vancouver Island, and are a great place to fish, dive, and explore the local islands. The Fraser River is a famed location for top-notch salmon fishing, and the turquoise waters are beautiful for diving to see bright-colored rockfish, colonies of stalked anemones and tubeworm plumes, as well as the world’s largest species of octopus. Boating here is relatively protected, and there are dockside restaurants, marina space, boat-in cabins for rent, mooring buoys near park islands, and much more. One of the most common kinds of boating activities to be found here is whale watching — the J, K, and L pods of resident orca whales are the most famous population in North America. There is a banner industry watching these magnificent beasts spend each spring to fall between the Gulf Islands and the San Juans. There is a kayak trail that allows boat-in campsites and stretches from south Puget Sound to Alaska, and features several sites through these islands. One important distinction that separates the San Juans from the Gulf Islands is the proximity of some of the Gulf Islands to the more metropolitan areas on Vancouver Island and the city of Vancouver. If you prefer not to boat into the city, British Columbia offers an extensive ferry system that allows pedestrians to explore many areas where they cannot (or do not want to) find marina space. Though the water is sheltered compared to the coast, there can still be some chop, particularly when it comes to the smaller, deeper channels between some islands. When tidal flow is against wind direction, this can cause very large wind waves and be an unpleasant surprise for those who suffer from motion sickness. This is the easier, beautiful route to southeast Alaska that all smaller boats take. If you are looking for an epic boating journey, this is an excellent choice. It is not to be done on a whim, however, as there are a number of things to consider. Marinas are not always available, and you will be spending many nights at anchor. Large logs are washed to sea with each rain, and they can hover just below the surface and can take out an engine or hull if you are boating blind. A well-researched agenda that includes pre-chosen fuel stops, meal and grocery planning, and a good marine chart as well as functional instrumentation to find unmarked rocks or wrecks will go a long way to ensuring that your trip is safe. Along the way, you will be treated to towering trees, bald eagles, seals and sea lions, harbor and Dall’s porpoises, and half a dozen species of whale. The portion of the inside passage in BC begins at the gulf islands through a region called the Strait of Georgia and continues northward through Johnstone Strait, the narrow passage between mainland BC and Vancouver Island. Above Vancouver Island is the most exposed portion of the trip, and the only place where you will experience ocean swells. This portion is called Hecate Strait, and is located near Haida Gwaii, or Haida Island. The island, which is owned by the Haida Indians, has trails, lodging, food, and a beautiful selection of handcrafted native northwest Haida art. Finally, through the Fitz Hugh Sound, the rest of the area is sheltered behind other large islands, which have varying degrees of marinas, fuel, and supplies before it heads into Alaska. Though the eastern side of this immense island is covered in the previous sections, the ocean side of Vancouver Island has its own boating joys, provided you are willing to deal with ocean swells. The most famous port on this island is Victoria, and this can be a destination on its own. Situated on the southern tip of Vancouver Island, just off the Strait of Juan de Fuca, this city has a flair of Victorian England, from the clean city building facades to the themed tourist gifts to high tea at the Empress Hotel. Buses from here can take you to the famous Butchart Gardens, which is a must-see day trip if you spend on taking several days to see the city. Coastal towns on Vancouver Island like Tofino offer sheltered places to dock your boat, fuel up, and visit the local shops. 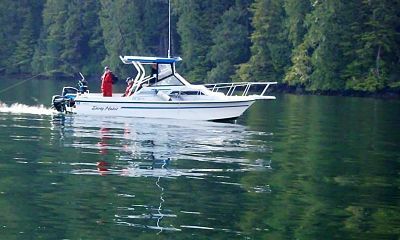 In addition to offshore boating and deep sea fishing, there are a few hot springs that are available just off the outer shore of Vancouver Island, and the smaller islands to the north. Tofino, Ucuelet, and Port Alberni are the three ports to visit to get the full experience of the national park called Pacific Rim Park, a highlight of this route. The high-level volcanic activity of this region offers these heat vents, and creates great places to take a hot soak. Be careful of the sulfuric content of the vents, however, as they will be a bit smelly at times, and can tarnish jewelry by giving it a black outer coating. For those who prefer freshwater boating, there are a large number of lakes and streams to be found in BC and Alberta. Tens of thousands of miles of connected streams and lakes stretch northward into the Northwest Territories and Yukon, and offer amazing opportunities for remote canoe or kayak trips. Fishing sites for salmon and trout are so abundant that it would take a lifetime to find them all. However, much of these are shallow, smaller order streams that are great for shallow boats that can take the occasional portage. If you are looking for some of the best places in BC and Alberta to do some powerboating or sailing, there are lots of opportunities. Larger rivers include the Fraser River just north of the Canadian border, or the Peace River that is found along the Alaskan Highway at the north end of British Columbia. In truth, it is easy to find access to large boating lakes and navigable rivers near many of the bigger towns in BC. These lakes and rivers are great for fishing, and they often get warm enough in the summer for tubing, jet-skiing, waterskiing, and more. This is very different than the cool Pacific Ocean, and gives an advantage to those who love to swim. Probably the most famous place to boat in the interior portion of western Canada is along Lake Louise, in the Banff area. Here, large snow-capped mountains jut steeply from the calm turquoise waters, creating a spectacular view that people come from around the world to experience. 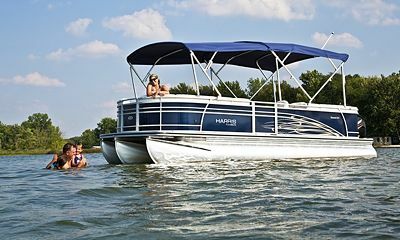 This is a great option for people who prefer to day boat and then spend evenings in a bit more luxury. The amenities and lodging options in this region are some of the best in western Canada. No matter your preferred style of boat or your timeline, there are great options to be found in western Canada. Even better, the people here are friendly and helpful, and will provide lots more excellent local suggestions when you come to visit. Be certain to pack lots of layers, as the weather here, even in summer, can be cool at times, and rain is always a possibility. Also, if you are boating and camping, arm yourself with insect repellant, as there may be a number of large flying species who love the taste of tourists. A well-prepared boater is sure to have a memorable time here, and to leave counting the days before they can return to discover even more of this nation’s beautiful waters.